The movie is distributed by Columbia Pictures and was released on 28th March 2012 in the UK. The movie is called The Pirates! Band Of Misfits in the US and was released on 27th April. See here for a list of opening dates across the world. On Wednesday 21st March David Tennant attended the premiere of The Pirates! In An Adventure With Scientists movie at the Mayfair Hotel in London. David recorded most of his audio in June 2011 although he has worked on it at various times for the past three years. It was released on DVD in Europe on 10th September and had some extras which David had made a recording for. The Pirates! movie has been nominated for the Best Animated Feature Award in the 2013 Oscars and for a MPSE Golden Reel Award. For posts related to The Pirates on Blogger.com click here. Tuesday 20th March at 11.35pm Film 2012 with Claudia Winkleman on BBC One will review The Pirates! On Sunday 25th March at the Odeon at The Point Village in Dublin there will be a special charity screening of The Pirates! In An Adventure With Scientists with all proceeds going to The Jack and Jill Children�s Foundation. Thursday 29th March at 5.45pm on CBBC Blue Peter has a The Pirates! feature. Friday 30th March at 7.05am on Channel 4 Freshly Squeezed (the celebrity interview show) says that it will have "interviews with the actors providing the voices for Aardman's new animated movie The Pirates! In an Adventure With Scientists including Hugh Grant and David Tennant." The BBC have announced that Series Two of Twenty Twelve will start transmission on Friday 30th March at 10am but it is most likely that they actually mean 10pm. 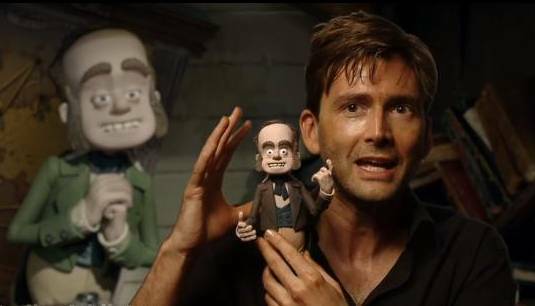 There will also be a special episode of Twenty Twelve during Sport Relief on Friday 23rd at 10pm on BBC Two but it is not known whether or not David Tennant will be providing the voice-over.